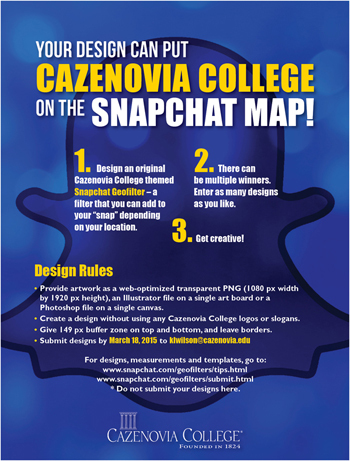 Your Geo-Filter Design Can Put Cazenovia College On The Snapchat Map! Create an original Cazenovia College-themed geo-filter design to be used on campus! Be inspired by the Equine Education Center, the quad, the Student Center – the possibilities are endless! There can be multiple winners and each person can submit more than one design. Snapchat is a video/picture sharing social media platform that allows users to send “snaps” to their followers. Snapchat settings allow users to “jazz” up their snaps by adding text, drawings and filters. Filters include black and white, sepia tone, the weather, mph (miles per hour) and recently, geo-filters. A geo-filter is a filter that can only be added by users in a specific location. For example, Susquehanna University has a geo-filter that has a squirrel with “Susqy” next to it. Only people on campus or in the area have the option to use the filter. Many cities and now colleges are jumping on the bandwagon and we’d like to do the same! give 149 px buffer zone on top and bottom of phone screen and leave borders. Snapchat provides Photoshop and Illustrator templates to download that are pre-configured with the correct size; they can be downloaded from the following website location: https://www.snapchat.com/geofilters/submit.html. This page also gives you the option to submit your artwork; please do not submit your design with this page. Details about where to submit your designs are provided below. In the Illustrator file, it gives examples of borders and what is not acceptable. For complete measurements, visit: https://www.snapchat.com/geofilters/tips.html. Submit your designs by March 24, 2015 by email at klwilson@cazenovia.edu. Winners will be decided by five judges who are members of the Cazenovia College community: Donna Greene, visiting instructor of Visual Communications; Andrea Hempstead, visiting instructor of Visual Communications; Scott Jensen, associate professor of Visual Communications; John Seiter, art director; and Laurie Selleck, program director of Visual Communications. The winning designs will be announced and sent to Snapchat for the ultimate decision. If you have any questions, please contact Kelly Wilson, social media coordinator, at klwilson@cazenovia.edu.